- 2-minute walk to Pleasure Point Marina. - Spa with lake views on the deck. - Less than 2 miles to hiking trails with amazing views. 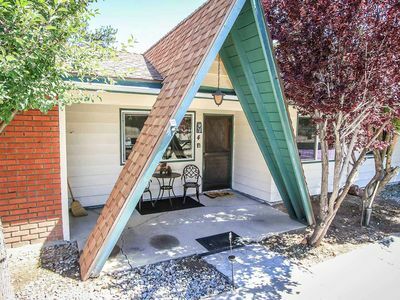 - Less than 2 miles to Alpine Slide, go carts, and mini golf. Come play, relax, and unplug. 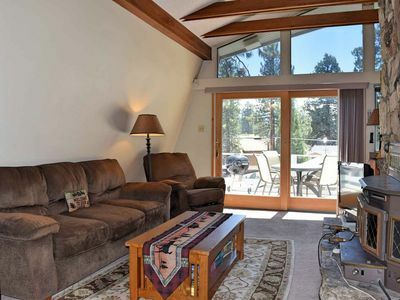 Lakeview Pines is an authentic Big Bear Cabin. 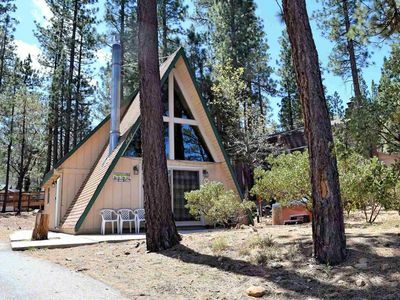 It's suitable for up to seven guests looking for local flavor and a true Big Bear adventure. 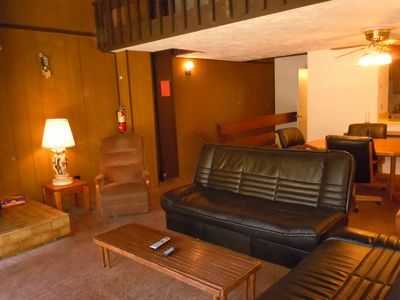 The decor is carefully crafted to maximize comfort. 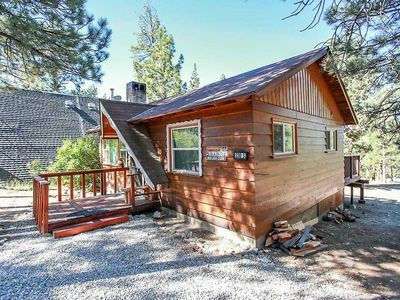 The cabin is around 1300 square feet so you'll have plenty of space to unwind. 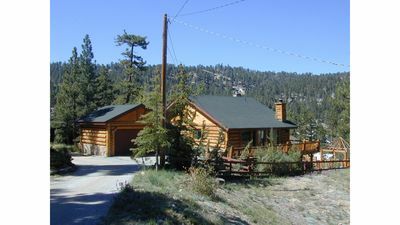 The cabin is located in one of the most desirable neighborhoods in Big Bear. 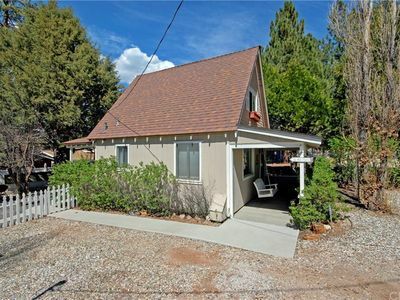 It boasts easy access to the lake, village, and all that Big Bear has to offer. 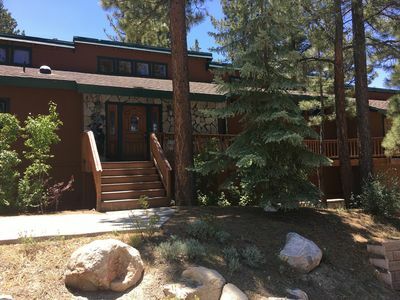 If you're looking to get in touch with nature you'll be just minutes from one of the most popular hiking trails in Big Bear or check out the Big Bear discovery center to learn more about the area and hike. 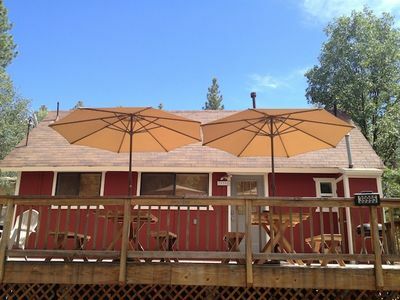 Enjoy a short ride to the Big Bear Zoo. Where bears, foxes, wolves, mountain lions, owls, and eagles are waiting to meet you. There are 2 full bathrooms, one on each level. 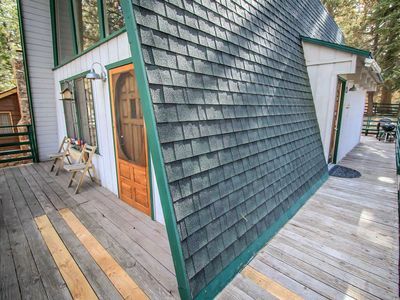 Here's a few common questions and answers that will help you decide if Lakeview Pines is a good fit for your mountain adventure. 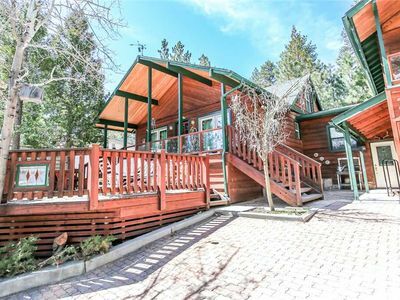 Is Lakeview Pines a good place for children? 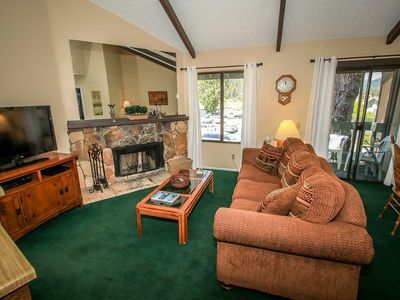 We've had many families stay at Lakeview Pines and they've found it perfect for children. 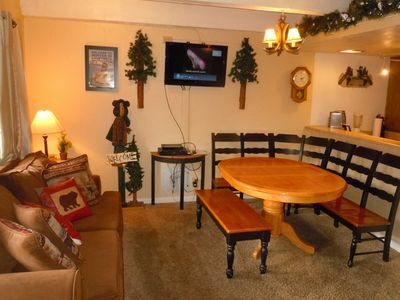 The large open floor plan lends itself to plenty of space for everyone to enjoy the cabin. The bunk beds are always a hit with kids. 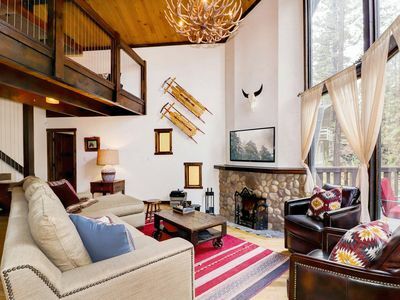 There's nothing like coming back after a long day on the slopes or trails and jumping in the spa. 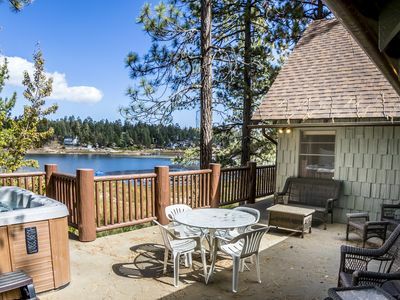 It boasts a lake view if you jump in during the day or hop in at night and enjoy the stars. 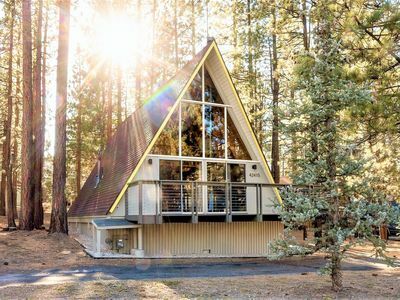 Can we cook at Lakeview Pines? 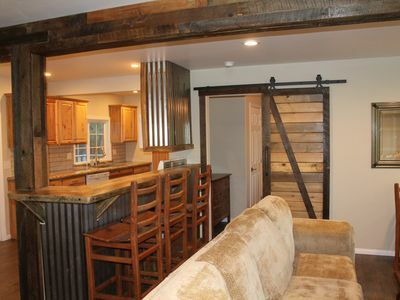 You'll love having the ability to stay in and cook. 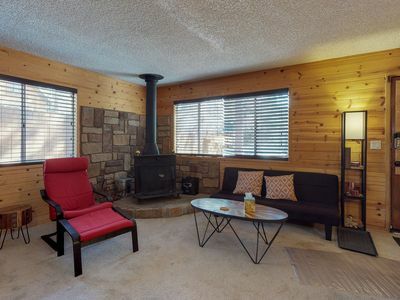 The cabin is fully equipped with a gas range and microwave. We keep the kitchen stocked with all the basic utensils, pots, pans, plates, and glassware. You'll have no problem feeding the hungriest of bears. When you're done throw your dishes in the dishwasher and enjoy time with the family. We also provide a propane BBQ for those summer nights when you can't stand to be inside. We also provide a toaster and coffeemaker for those early mornings. Yes! It'll keep you warm on the coldest of nights. Grab some firewood from a local gas station or grocery store (you can find it just about anywhere), and enjoy an evening in front of the fire. What kind of experience can my pet expect? We love dogs and understand how difficult it can be to travel without your pet. We provide dog dishes for food and water. As far as activities are concerned we'd recommend a walk around the neighborhood or checking out one of the many dog friendly hiking trails. They are sure to tire out the most athletic pups. Sorry, we don't allow cats. If you're interested in booking and haven't quite made up your mind, please contact us with all your questions. Rooster's Den - Walk to the Lake! 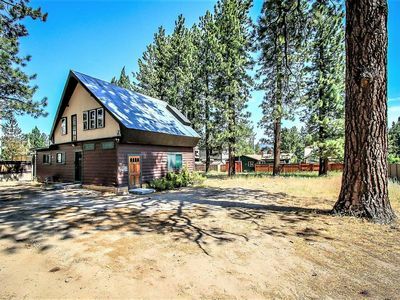 Gathering Place: Near Lake! Game Table! BBQ! Cable TV! Windows! Laundry! 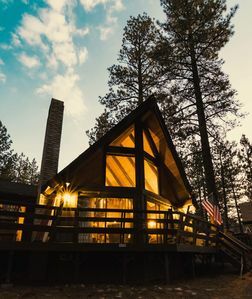 Private and secluded logged cabin. Lake and sunset views. Boulder Bay Cove Lakefront: Views! Hot Tub! Foosball! Historic Features! Updated Kitchen! Timberline Lodge: Backs to the National Forest! Close to Bear Mtn! 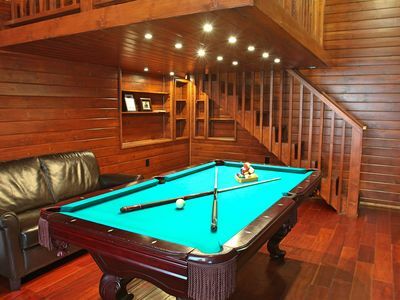 Pool Table! Hot Tub! La Vie Boheme: Luxury! Walk to Snow Summit! Foosball! Hot Tub! Gas BBQ! Internet!